The aha moment came when curious biologists were pondering a couple of flamingo cadavers. Humans consider standing on one leg something best done in a yoga class. Flamingos, on the other hand, consider it the most comfortable sleeping position. And they never seem to fall. The reason behind it remains obscure. Some scientists hypothesized it might have to do with regulating body temperature. Others wondered if it reduced muscle fatigue. Now, thanks Atlanta biologists Young-Hui Chang of Georgia Tech and Lena Ting of Emory University, science’s understanding of flamingo mechanics has taken a giant step forward. When a flamingo is ready to nod off, it lifts one leg and instinctively moves its body so its single foot is centered directly under the bird’s carriage. The two biologists began their investigation with an unsuccessful stakeout at Zoo Atlanta. So they put out a call to area zoos. Alabama’s Birmingham Zoo had just euthanized two flamingos, which they sent to the researchers. The duo began examining them, when something astounding happened. Chang held one of the cadavers up by its leg, which immediately snapped into place. He was able to place the dead bird on the table, where it stood as if it were merely sleeping. Even more surprising? The cadavers couldn’t stand on two legs. The bird’s skeleton appears to be the key. As with humans, flamingos have two main joints on their leg. The one you can see, that bends backward, is not the knee. That’s actually the bird’s ankle. Its knee, meanwhile, is hidden in the bird’s feathers at the fatter part of its body. When the flamingo is ready to nod off, it lifts one leg and instinctively moves its body so its single foot isn’t under its hip. Instead, it’s centered directly under the carriage of the bird. Meanwhile, pulling the other leg up forces the knee to bend, which the flamingo rests on. All the joints essentially snap into place. “If you look at the bird from the front, while they’re standing on one leg, the foot is directly beneath the body, which means that their leg is angled inward. That’s the pose you have to strike in order to engage the stay mechanism,” Chang told the BBC. As the flamingo remains nearly perfectly still while sleeping, gravity does the rest, keeping the bird in place. 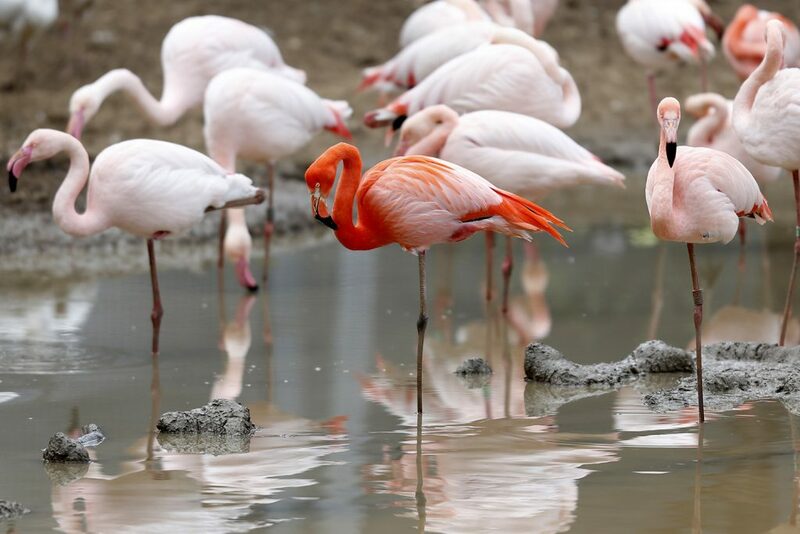 While the how doesn’t necessarily explain why flamingos sleep on one leg, it does suggest that the bird isn’t merely reducing muscle fatigue. After all, it could stand without using its muscles at all, which suggests it might be conserving energy. Matthew Anderson of St. Joseph’s University, who studies flamingos, called the study a “significant step forward” but said questions remain. Chang and Ting told Discover magazine more research is forthcoming. Thus far, though, the duo has carried out the research on their own time, sans funding. “It was a labor of love – doing science simply for the sake of learning how nature works,” Chang said.